Power is economic in nature; power by force is merely a short cut that usually doesn't last. China just overtook the United States as the largest economy in the world. Geopolitically this fact will not remain without consequences. In Africa democracy is already retracting. Democracy without the root of liberty: some world leaders have managed to stay in office well past their constitutionally mandated expiration dates. Democrats are lamenting, democracy is waning in Africa. It is because African strongmen "rule with an iron fist" and "manage to stay on passed their constitutional expiration dates". (Source) But that conclusion betrays a very limited understanding of what democracy really is. In this case we can say with confidence that 'the' democracy does not exist. The USA is a democracy, but so are Russia and Iran. It all depends on your definition. To some socialists, democracy is even synonymous with their ideology. But what most people actually mean by democracy, is Liberty. In the classical sense of the word, democracy means "rule by the people". While the USA is not a democracy but a Constitutional Republic, it is ruled by the people in the truest sense of the word. It means that the Government is the servant of the people. While most states in Europe like to think of themselves as ruled by the people, the ruling elites mentally and truly believe they know better than their grassroots. The mistake lies in a concept which can easily escape legal and constitutional constrictions once it is mentally uprooted or never existed in the first place: the sovereignty, not of the monarch, the president or the government, but of individual man. morality -- personal choice -- is excluded from the law, ensuring that the Government doesn't infringe on individual choices. The functioning of a free, democratic state does not merely depend on the role of the Government; the people are also collectively responsible for the state of Liberty. A free people are well educated, they stay well informed, they uphold the law, and they make personal choices that are morally good (rooted in reality). Democrats often ignore this philosophical basis of democracy; they start from the ballot box in the belief that 'power sharing' will bring about a state and a people with a proper ethos that will sustain Liberty. But that is reversing cause and effect: they are mimicking the effect in the belief that the cause will ensue. This is impossible. We have seen it recently up close in Egypt where the Arab Spring was expected to 'spontaneously' result in a moral, civil society living by the rule of law. Needless to say, this was a far cry from what really took place. A disaster was averted in the nick of time. Even established democracies, like we see in Turkey, can fairly easily be uprooted if a majority of the people no longer support it mentally. Russia is an example where democracy has never been part of the mental make up of the people. The same is true of premodern Africa. Real power is rooted in economics. Some have been yearning for the death of Pax Americana. Obama was the president who for six long years has been presiding over the process of winding down American hegemony. The power balance and the status quo of the post World War II world is becoming unstuck at an unprecedented rate. This week we saw the news that China has surpassed the US as far as economic output is concerned. (Source) It doesn't take the brains of an Einstein to predict that the expansion of democracy will cease, to make place for more autocratic rule and new forms of dictatorships in the image of the new economic power house, China. China has made a great deal of investments in infrastructure, energy and resources in Africa in the last decade. Source: AFP/Aid Data Center For Global Development. China has spent nearly $100 billion in African projects over the last decade. 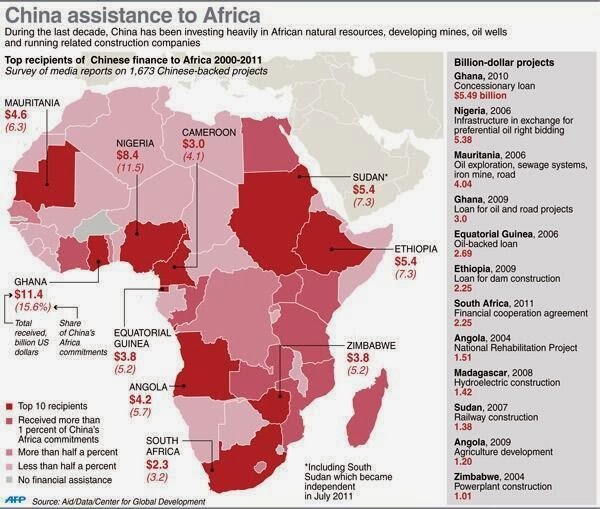 Between 2000 and 2011, China spent more than $73 billion investing in natural resources, mines, oil wells and other projects in Africa, according to statistics from Aid Data and the Center for Global Development. 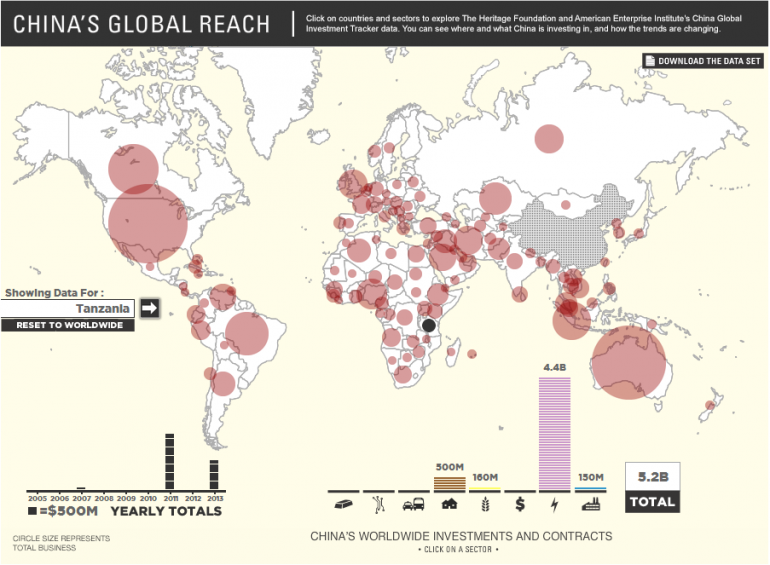 The Heritage Foundation compiled years' worth of data to show how China is investing around the world. Source: The Heritage Foundation. Many of the largest projects were oil-related. For instance, a $5.38 billion project in Nigeria that involved “infrastructure in exchange for preferential oil rights bidding,” or $4.04 billion spent in Mauritania for “oil exploration, sewage systems, iron mine and roads.” Last year, Chinese foreign direct investment in Tanzania-based projects topped $1.5 billion, according to the China Global Investment Tracker. The majority of projects, worth $4.4 billion, were in the energy sector, which typically means oil-related activities. It’s a similar story in other countries, where mining and oil dominate Chinese projects. In Nigeria, for example, China invested $20.5 billion in 2013 -- $9.2 billion of which was in the energy sector. The autocratic states in the image of China will in the future tolerate even less freer states from meddling into their 'internal affairs'. And they expect to be treated as the moral equals of more liberal states. Rights will no longer be the standard for a morally good country. As the power of freer states is diminishing, so will their appetite decrease to spread democracy. The danger of Neocons spreading their ideology by force looks increasingly less likely. Instead we must prepare for the expansion of brute power politics and moral relativism in foreign policy. Michiavelli is back on the world stage. Is America Still a Force for the Good?